In the world of children's films, Pixar has built a reputation for itself as the studio to trust. Even when their filmmakers are making a blatant cash grab with something like Cars 2, you know that the finished product will look incredible, be cheery, bright and good-hearted, and move like a winner. When you live in a world that's always under the threat of another Ice Age movie, the idea of a Cars 3 (and/or however many Planes installments they've got planned) can seem almost welcome. Problem: Cars 2 is a bore and any person who isn't obsessed with the technical aspects of digital animation or still counting their age on their hands knows it. And it's just as much from Pixar as Up or the Toy Story films, proudly so. 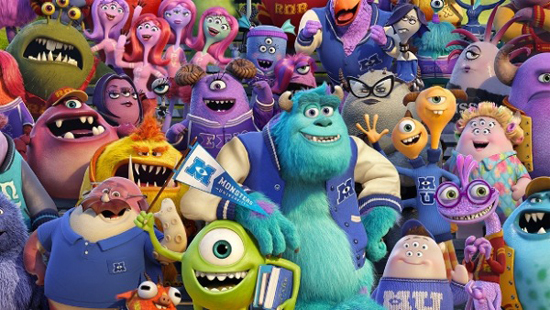 So is Monsters University, a prequel to Monsters, Inc., in which young monster Mike (the voice of Billy Crystal) meets young Sulley (John Goodman) and the two prepare to matriculate at Monsters U. It's a school that feels more akin to a DeVry-like technical institute than a university, feeding fresh employees into Monsters, Inc. its seeming sole task. But deeper questions of purpose aren't really on anybody's to-do list around here, not when there's bouncy action waiting. The plot is Revenge of the Nerds for kids, as the misfit monster fraternity Oozma Kappa -- which counts Sulley and Mike as members -- stakes its very existence and enrollment on a series of intramural "Scare Games," in which the school's various creatures compete to see who can terrify simulated children the hardest. And no extra points earned for guessing either the outcome of these exercises or how much believing in oneself plays a role in accomplishing that outcome. Point A must connect to Point B cleanly when hundreds of millions of dollars in production costs and merchandizing projections are on the line. It's that Cars 2 thing again: impeccably crafted, somewhat humorous, aimed at little ones and content to know its place. Are there difficult, fictional lessons to be learned about aptitude, loss and failure from this story? Yes, there are. You just won't be hearing about them during its running time. They exist almost exclusively elsewhere, in the animated Peanuts films of the early 1970s, the output of Studio Ghibli and in other, more ambitious Pixar movies. No hard-core bummers allowed in this world, one big enough to contain a single concept and no others: the admittedly genius goal of defusing real-life childhood fears by turning the concept of monsters on its head and rewriting them as chatty, adorable, mutant Skittles. All else must serve that premise or be denied entrance to Monsters Land. The solution to this aesthetic problem, long-term, seems to be a Pixar where art is coded one way and finely crafted merch-moving opportunism another. I don't have all the kinks worked out of that idea just yet. I'll leave it to Pixar to execute the details. The people there have already created a body of work that can be divided up into two camps with wildly different agendas. Now all that's left is the sorting.